Never let a serious opportunity go to waste. …Even if it tramples all over Mother’s Day. 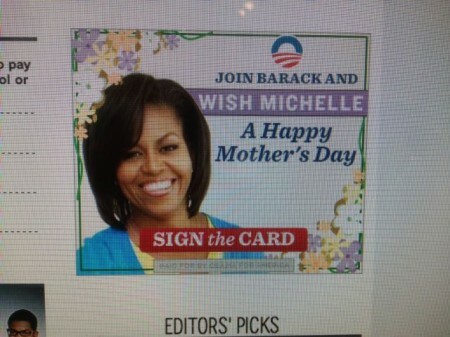 The Obama White House is using Mother’s Day to raise cash for the campaign. The Obama campaign, which seemingly will try any fundraising scheme that occurs to it, is using Mother’s Day to get people to part with their money. If you’re lucky enough to get to marry your best friend, you’ll know what I’m talking about. Michelle amazes me every day, and in the years we’ve been together, nothing inspires me more than watching her be a mom to our two girls . . . This year, I wanted to try something a little different. I know Michelle treasures every single person who is part of this movement we’ve built, so I’m hoping each of you will sign my card to her today. It’ll mean a lot to her. Will you join me in wishing Michelle a happy Mother’s Day? The message then provides a link you can access to wish Michelle a happy Mother’s Day. Maybe they need cash for her next vacation?